WATCH: Red Dead Redemption 2 Reveal Trailer | Nerd Much? 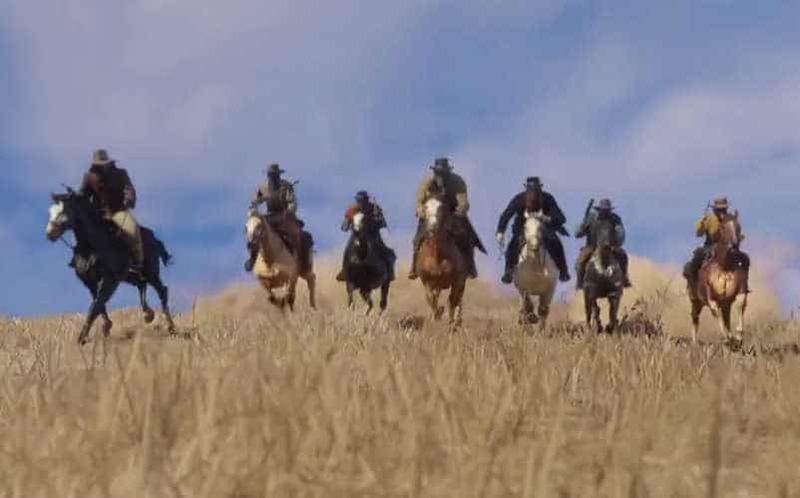 The Red Dead Redemption 2 reveal trailer has landed and left us speechless. After enough time to process what we saw, let’s dig into what they showed. Let’s get this out of the way, the Red Dead Redemption 2 reveal trailer is beautiful. It’s more than that. It’s gorgeous. The world feels natural, expansive, and real. From the first shot, we can see that the land just keeps going. There is also a lot more wildlife this time around. Almost every scene seems to show off the different animals you’ll encounter. What we can also see it that Red Dead Redemption 2 looks to take place after the events of the first game. How do we know this? Because the general store shot in the reveal trailer shows electricity. Turn your attention to the telephone pole on the right side of the image to see for yourself. Additionally, it definitely feels like the story will center around this group of seven. We saw them in the promotional image, and we see them again at the end of this trailer. In Rockstar fashion, they left us wanting so much more than they actually gave us. What did you think of the Red Dead Redemption 2 reveal trailer? If you are anything like us, you’re eagerly awaiting more information before its Fall 2017 release. Don’t worry, we will keep you posted.